Learn more about the Initiative for Individuals with Intellectual and Developmental Disabilities. A construction-paper tree (above) unfurled with emotion at Seattle Pacific University’s Voices of Autism conference. 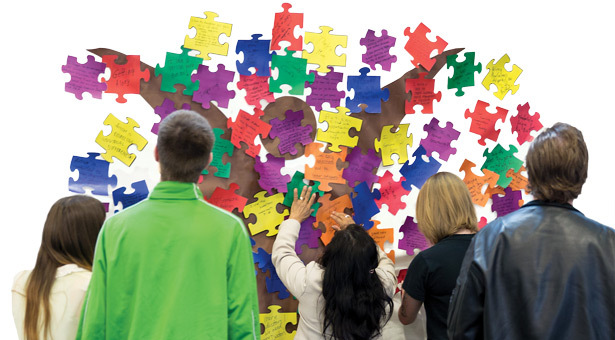 The vibrant, oversized poster invited visitors to express their thoughts on brightly colored notes. SPU’s School of Psychology, Family, and Community hosted the daylong event to coincide with April’s National Autism Awareness Month. Autism Spectrum Disorders are developmental disorders that can impact behavioral, cognitive, communication, and social skills. In the U.S., one in 68 children is diagnosed with ASD. The conference, free and open to the public, included a resource fair with more than 25 vendors, lectures by clinicians and researchers, as well as a panel discussion featuring young adults living with autism. The conference focused on resources and research to improve the adaptive functioning — the skills of daily living and interaction — of children with ASD. More than 175 people attended with some traveling from as far as California. Ellen Geib, a third-year graduate student in clinical psychology, has two siblings with ASD, and her family’s journey was all the more challenging because they lived in an area without abundant resources. She understands first-hand the importance both of SPU’s clinical research and the effort to apply it at a grassroots level. Part of the conference’s purpose, particularly via the panel discussion, was to celebrate the diverse ways in which ASD individuals lead successful, fulfilling lives. “Living with autism throughout my life, it’s given me some challenges and some benefits as well,” said Nick Eveland, a 21-year-old with ASD who works at Everett Community College and spoke at the panel discussion. Such stories resonated personally and professionally. Claire Fischer, a speech-language pathologist at Valley Medical Center’s Children’s Therapy Clinic, was enthusiastic to learn more about ASD in order to better help her patients. The hope is to make the conference an annual event and continue building on the success of finding common ground and shared experiences. “We shouldn’t limit people. Everyone has the ability to contribute, a spiritual nature, and capacity for faith. We are all full human beings,” Wilson says.